Spring is officially here and you know what that means: time to break out the brightly-colored attire and its corresponding bling! 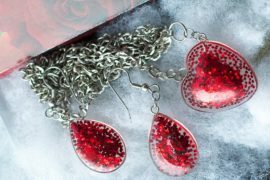 If you’re anything like me, though, finding the right jewelry to match your outfit can be really difficult if it is disorganized. Lucky for you (and for me! 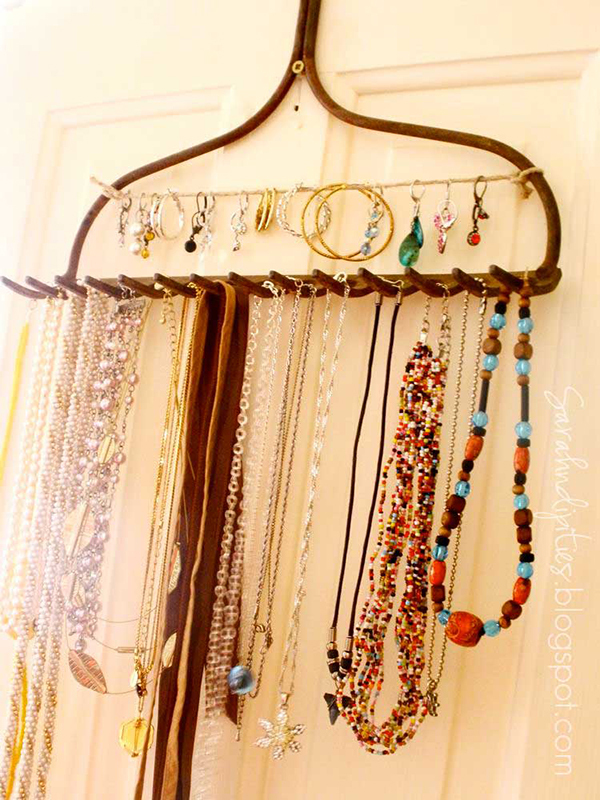 ), there are some really great ideas out there for DIY jewelry organizers! 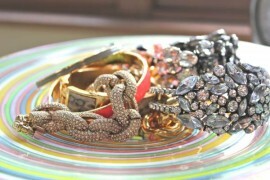 Here are 11 fun, creative, and stylish ideas for organizing your jewelry. Feeling like bringing a little bit of nature indoors? 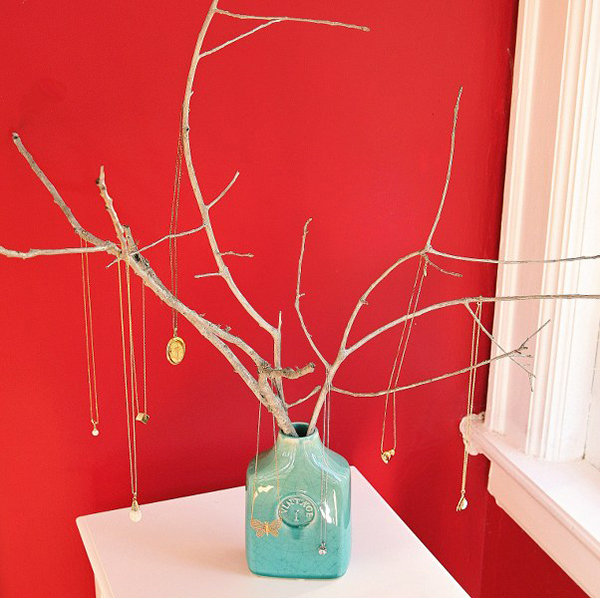 Taking the idea of a jewelry tree literally, both My So Called Crafty Life and Sincerely Yours made gorgeous jewelry trees from sticks they found in their own backyards! 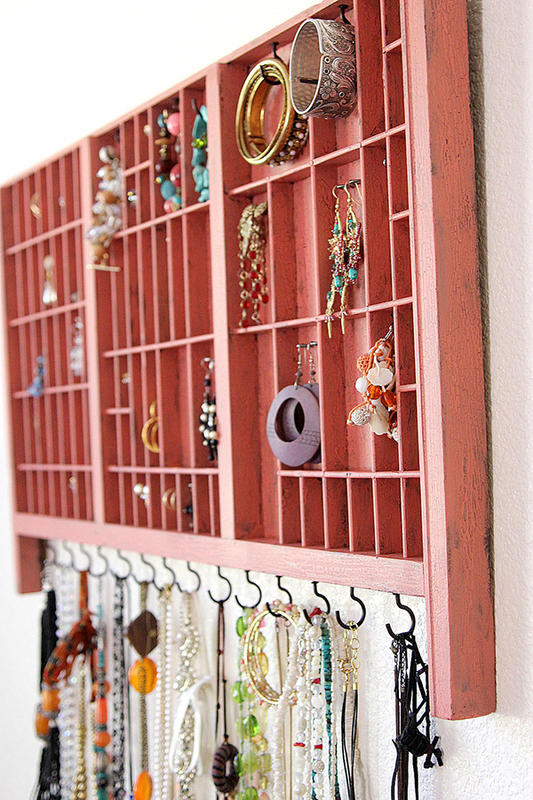 Slap on a little spray paint and some sort of base and you have yourself an inexpensive (or even free if you use leftover materials from around your home) jewelery organizer that certainly makes a beautiful statement. Our next two ideas by The 36th Avenue and Say Yes To Hoboken definitely prove that pegboards are not just for basements, garages, and workshops. 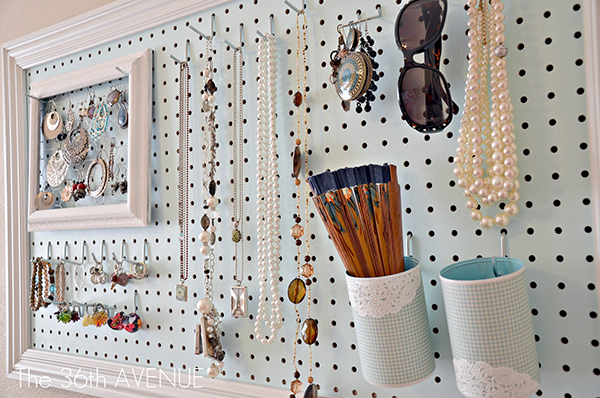 With a coat of paint and a DIY wood frame, these pegboard jewelry organizers are an attractive, fun addition to a bedroom or dressing area! For those of you looking for something a little smaller and simpler (i.e. all of us apartment-dwellers! 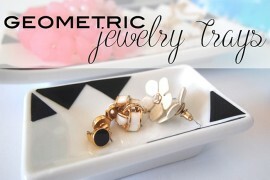 ), making a DIY jewelry organizer can be as simple as using a nice frame or shadowbox and adding some hooks! 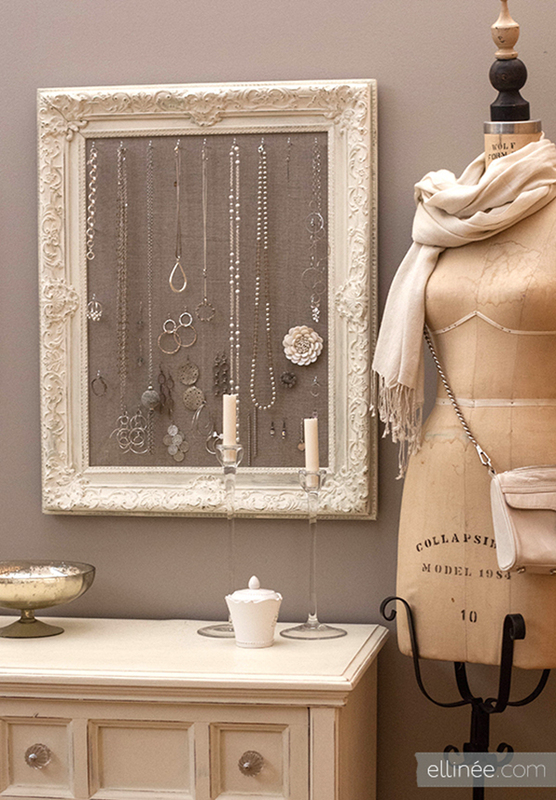 The Elli Blog shared a stunning jewelery organizer made with an antique frame, linen backing, and a few cup hooks. 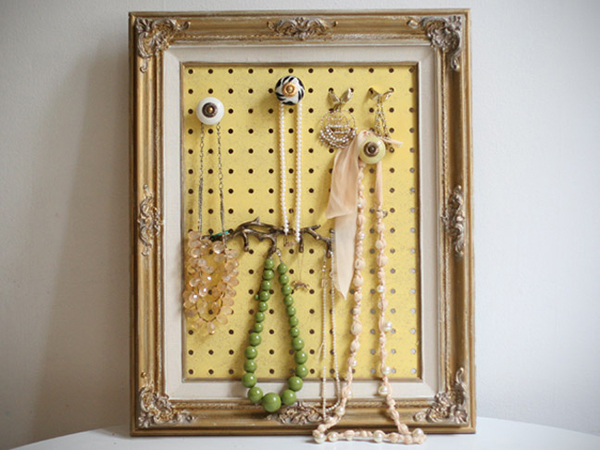 Another approach to the framed jewelry organizer by Nomadic D. uses an open wood frame, a few nails, some chain, and ribbon to proudly show off a spectacular earring and watch collection. 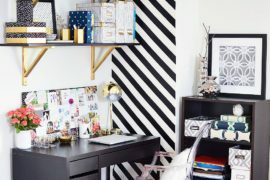 Have an old desk drawer or wood tray laying around? 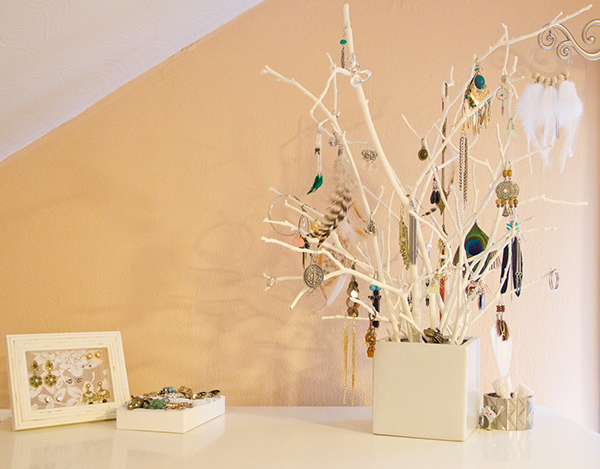 Give it a little TLC and it could be a stunning DIY jewelry organizer in no time! 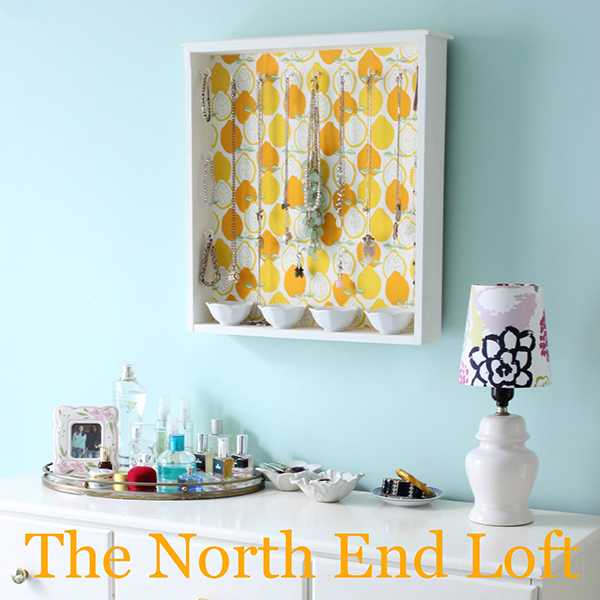 North End Loft shows us how to re-purpose an old desk drawer with some fabric, paint, hooks, and shallow bowls to create a lovely and efficient jewelry station. Create-Celebrate-Explore used an antique wood type set tray to make an awesomely-rustic jewelry organizer with a little crackle pain and some elbow grease! 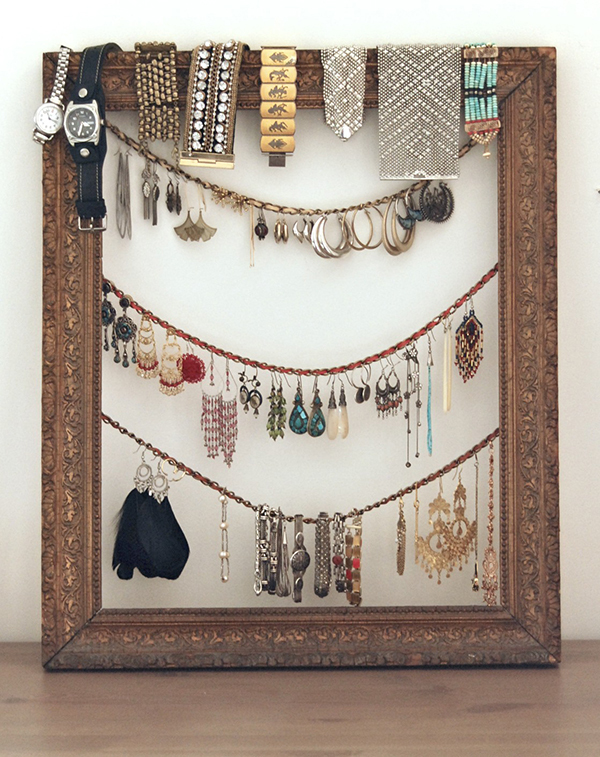 Looking for more of a quirky or unique way to display and organize your jewelry? 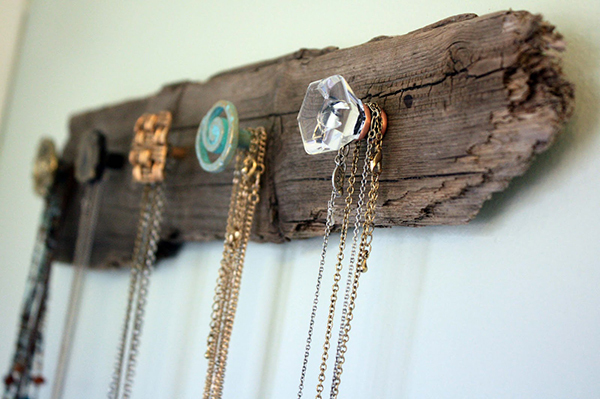 Visibly Moved used an eclectic collection of knobs screwed into a piece of driftwood as an amazing DIY jewelry organizer. 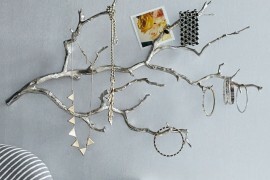 Another fun way to organize your jewels is to hang them from a rake. A rake? Yes, a rake! 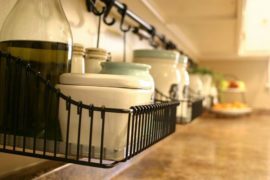 Check out how awesome this old rake head looks as a jewelry organizer (made by Sarahndipities). Finally, to finish off our collection of DIY Jewelry organizers, Gears Co. handmade this hand made (ha-ha-ha say that three times fast!) 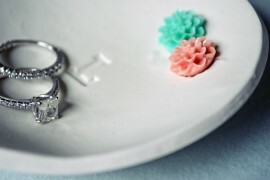 from plaster and a rubber glove as a unique way to organize and show off her favorite jewelry. 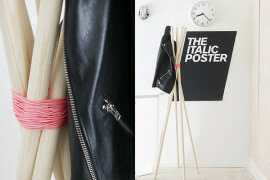 Although the tutorial is in Spanish, I think that the pictures explain the DIY process very clearly! But in case you need a little extra help, I was able to find an English tutorial here. 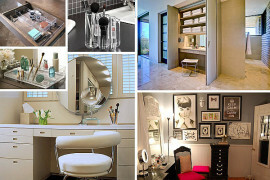 Now that I’ve given you some fantastic inspiration, it’s time for you to DIY! Happy spring cleaning and organizing. Oh, and enjoy showing off your favorite bangles, baubles, and beads!